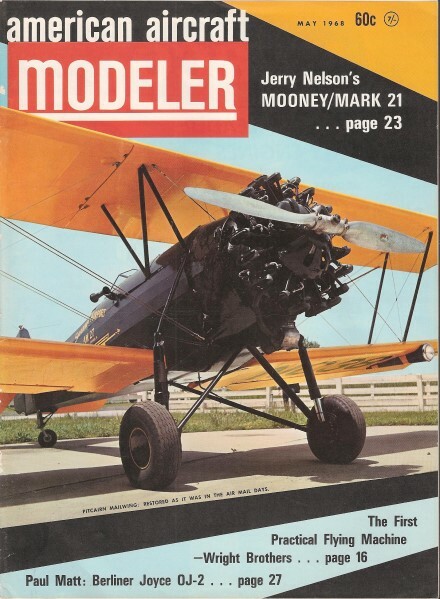 The 1st half of this story about the author's personal experience with the Wright Brothers, "Four Keys to the Sky," was printed the April 1968 American Aircraft Modeler. Each piece of the puzzle was a scientific triumph, the end result a truly miraculous achievement. Concluding a two-part article, the author recounts little known stories behind the Wright Brothers' persistent attempts to fly. The brothers flipped a coin to see who would make that first flight. Wilbur won and was in the air about three seconds. (Orville made first successful flight.) Wilbur in damaged machine after his brief hop. THE idea of mechanical power flight certainly was not new with the Wright Brothers. There had been many attempts made by others before the Wrights even thought of building their first gliders. In the 1840's Sir George Cayley, William Samuel Henson and John Stringfellow, a trio of Englishmen, experimented with steam-powered models. 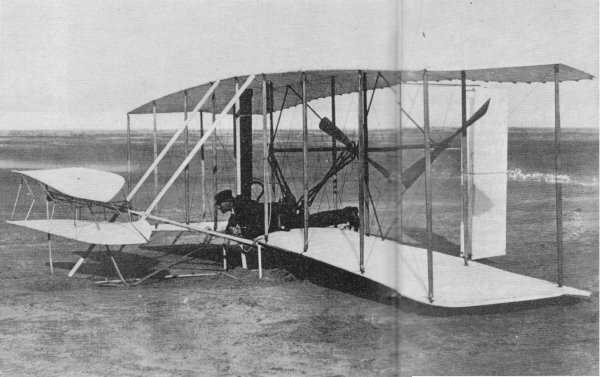 Stringfellow's design with a 20-foot wing span, and propelled by twin air screws, is credited with being the first engine-driven model airplane to fly. Another Englishman, Thomas Moy and his assistant, R. E. Shill built their full-scale "aerial steamer" in 1875, a contraption powered by a three-horsepower steam engine and twin, six-bladed, windmill-like fans, and resting on what was probably the first tricycle landing gear. Tested at Crystal Palace, London, Moy's crude craft lifted its 120 pounds a few inches off a board platform, but that was the end of it. Five years later, Thomas Edison applied his inventive genius to the development of a flying machine using a most unusual propulsion method. The inventor of the stock ticker as well as the light bulb, Edison used ticker tape made into gun-cotton jammed into a cylinder and exploded by an electric spark. This powerplant drove a rotor of a small helicopter model which Edison believed was the best approach to the problem of flight. If nothing else, he demonstrated that plane surfaces moving rapidly enough through the air would rise and carry some weight. He gave up the experiments when the engine blew up. Another propulsion method using compressed air in a small cylinder was tried successfully in models flown by Lawrence Hargrave of Sydney, Australia in 1890. About the same time the Frenchman, Clement F. Ader, built the "Eole" a man-carrying monoplane that weighed more than half a ton, propelled by a four-bladed airscrew driven by a 40-horse-power steam engine. The machine was uncontrollable and crashed, although it is claimed Ader flew it erratically for about 150 feet. Later improved models suffered similar fates. American-born Sir Hiram Maxim, who became a British subject and was knighted by Queen Victoria in 1894, came closest to success with his huge machine, a multiplane with over 5,000 square feet of wing area, powered by twin giant propellers and a 350-horsepower steam engine which burned benzine. On a final test with Sir Hiram and an assistant aboard, the air leviathan almost achieved free flight, but Maxim shut off the steam when a crash was inevitable. He dropped the experiment after that, but recorded -"Propulsion and lifting are solved problems, the rest is a matter of time." Time began to catch up quickly when the same year, Dr. Samuel Pierpont Langley, Director of the great Smithsonian Institution in Washington D. C., successfully flew his large model tandem monoplane powered by a steam engine. Launched by catapult Langley's Model No.5, called the "Aerodrome," achieved power flight over the Potomac, and made a three-point landing on the wide river without serious damage. 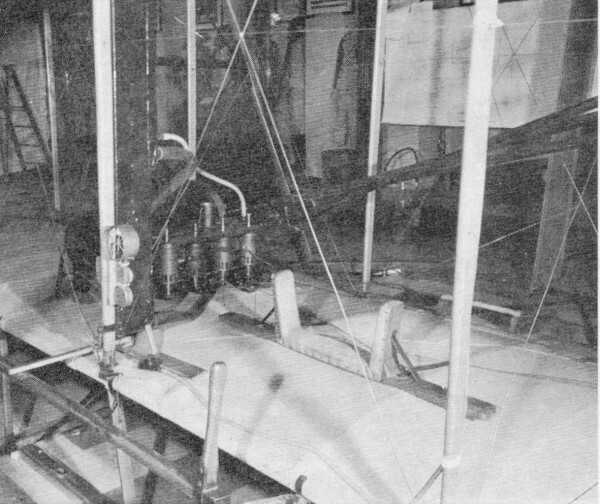 On the strength of this success, President McKinley appropriated $50,000 for Langley to use in the development of a full-scale, man-carrying, power-driven flying machine. This machine, patterned along the same lines as the model "Aerodrome," only four times its size, was powered by a five-cylinder, radial, air-cooled gasoline engine. It was in a state of final development for flight tests about the same time that the Wright Brothers, back in Dayton after their glider success in 1902, started work on their proposed power flyer. 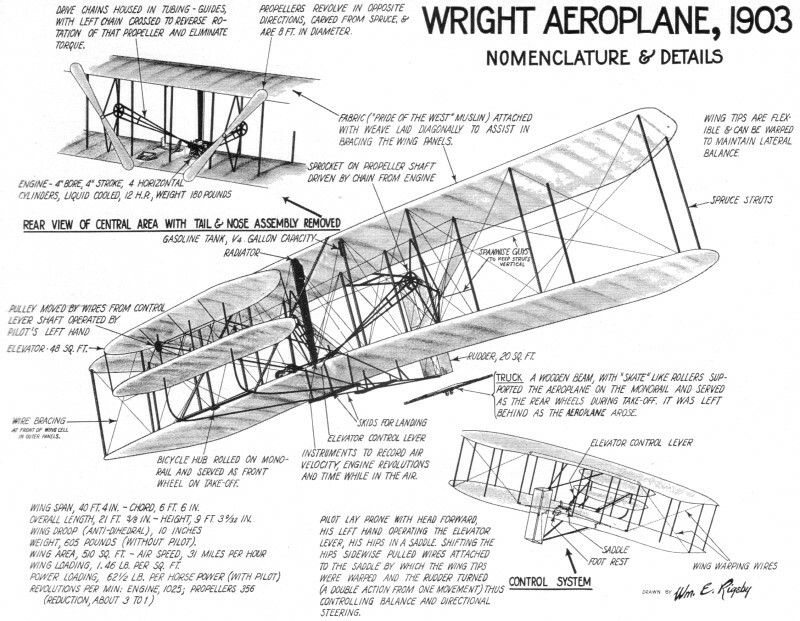 The Wright approach: The Wrights, of course, because of their extensive reading on the subject of aeronautics were well aware of these various experiments. "Sometimes, I think we read too much and were inclined to believe too much of what we read," Orville Wright once declared. "Certainly, this was true in the misinformation we had derived from the knowledge of others with regard to air pressures on wing surfaces and wing design. But it was even more serious when we began thinking about the power flyer. On the basis of what had gone before, we were of the belief that propulsion methods were no serious challenge. . . . We truthfully thought we could buy a light-weight gasoline engine from one of the automobile builders, who were making great strides with the horseless carriage. And we believed we could design efficient propellers by merely applying known facts from previously published data. . ."
On the basis of their own design calculations for their power flyer, the Wrights decided that an engine of about eight horsepower and not weighing more than 200 pounds would be most satisfactory. But when they wrote to various automobile manufacturers they got negative answers. It was a sore spot with Orville. "We believed," he often reflected, "that they (the auto builders) didn't believe much in human flight or anyone connected with it, so they simply avoided us in a polite manner." It turned out they decided to design and build their own engine. As Orville pointed out, they had had a little experience in this area when they built a small, one-cylinder, air-cooled gasoline motor for their machine shop. (It drove the fan for their "magic wind box.") With this limited knowledge and the help of their mechanic, Charley Taylor, who ran the bicycle shop in their absence at Kitty Hawk, they set about building an engine for the glider. Orville referred to this glider as "the 444" because their plans called for a powerplant of "four cylinders, four-inch bore and four-inch stroke." To make it lightweight, they used aluminum very extensively. The end result was most encouraging; complete with accessories their engine weighed only 170 pounds. The engine developed 12-horsepower, less than 15 pounds per horsepower which they considered a "decided advantage in weight," according to Orville. Although later he admitted, "We were to learn this wasn't a very good ratio, by the standards set by the automobile engine builders, who said it should have developed twice as much power for its weight." Orville maintained, however, that they were more than pleased with their gasoline engine. For one thing, he pointed out that it weighed considerably less than they had allowed for (about 25 pounds less) and developed half again as much horsepower. Since they had counted on the engine weighing about one-third of the power flyer's total weight, and developing only eight horsepower, the decreased weight of the engine and its increased horsepower permitted them to ''beef up" the airframe structure. The engine, itself, was quite remarkable for its period. In configuration, it was an in-line engine, four cylinders in a row and water-cooled. It had a max rpm of about 1500, at times hitting as high as 16-horsepower for brief running periods. The gasoline tank was about a foot long and three inches in diameter, not much larger than a 2-pound coffee can. The tank carried half a gallon of fuel. According to Orville this was sufficient fuel to operate the engine for about 15 minutes; enough for a flight of about ten miles. The Wrights designed the engine, but Charley Taylor built it. And one time Taylor told me - "It took about six weeks to build, then there was a lot of testing. . . . But the interesting thing is, when they left for Kitty Hawk with the power flyer, they told me to start work on another engine. They seemed pretty sure of success . . . "
Propeller problems: The problem of designing a propeller or propellers - their plans called for two air screws turning in opposite directions to offset torque - became far more complex than they had anticipated. Orville once put it this way - "With the machine moving forward, the air flowing backward over its wings, the propellers spinning sidewise, and everything moving at the same time, we didn't really know where to start!" They began, as they did when faced with the problem of wing design, by researching every possible source at the library for knowledge about propellers. Mostly what they found in published data pertained to marine propellers. There was very little about "air screws." Orville remarked one time that he was quite surprised that the others who had tried mechanical flight had made such little reference in their published data to the design of propellers. He said - "This led us to believe that they simply had turned to the data on marine propellers and applied this to their propeller designs for their flying machines. "And the truth is," he added, "we could find very little useful data about marine propellers." This, perhaps, was the turning point in their thinking about the propulsive force for their power flyer. It may well have been, their secret of success. Another key. We were talking one day in his laboratory about their small wind tunnel (the "magic wind box") and Orville explained that their tests with airfoils, which gave them so much gliding success, also were the answer to their propeller problem. I'll never forget his explanation: "We forgot all about what we learned about marine propellers and started thinking about the aerial propeller. as simply a revolving airfoil . . . Wilbur called it a horizontal lift device, similar to the idea of Penaud's little toy, and we began thinking in terms of thrust and lift being the same forces whether in a vertical or horizontal plane. . ."
The four-cylinder engine designed by the Wrights, was built by bicycle-mechanic Charley Taylor. Saddle and foot rest were designed for prone pilot who operated elevator lever with left hand, throttle with right. On that December 17 day in 1903, four flights were made, one for more than 850 feet. Crankshaft was connected to propellers with sprockets and bicycle chains. The chains ran through tubular casings; were crossed to cause propellers to turn in opposite directions. Fifth flight aimed at several miles, but gust smashed plane while at rest. The rest was simple applied science. They used their own data on air pressures and wing configuration (airfoils) in shaping the propeller blades and their angle of biting the air, to design an efficient propeller. When they had finished their aerodynamic studies of propellers (revolving airfoils) they had more knowledge on the subject than any of the other experimenters. The proof came on December 17, 1903 at Kitty Hawk. The power flyer: Orville almost always referred to the first successful airplane as "the power flyer," perhaps, because he regarded it as a larger version of the 1902 glider fitted with its own power plant to "manufacture its own wind for lift." 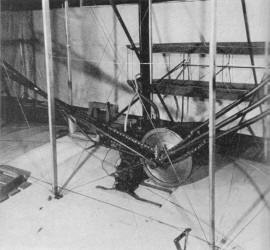 The machine had a wing span of 40 feet, eight inches, with a chord of six feet, six inches, about the same aspect ratio as the 1902 glider. A biplane, its wings were six feet apart, supported by numerous struts and wire trussing. It rested on sled-like runners, bent into straight uprights in the front to support the forward biplane elevators. They changed the vertical vanes (rudders) in the tail back to the dual arrangement of their first 1902 glider, with movable surfaces, The framework construction was spruce, with all plane surfaces covered with broadcloth. The engine was mounted on the lower wing just to the right of center. To balance the weight of the engine, the operator's position, a cradle-like arrangement, was on the left of the centerline. The engine crankshaft was connected to the propellers by a system of sprockets and bicycle chains. The chains ran through tubular casings to keep them from "flapping" and were crossed to cause the propellers to turn in opposite directions. Twin pusher propellers were mounted on long shafts extending rearward so that the propeller arc could clear the trailing edge of the wings. Orville once explained to me that they had decided on pushers because "we thought the propellers churning up the air in front would distort the flow of air over the wings and upset our air pressure tables regarding lift." He also pointed out that the weight of the propellers and their shafts, they felt, would better balance the machine vertically - ''like a teeter-totter on its fulcrum." Another thing he said was that the airfoil section of the propeller blades was "very close" to that of the wing camber. Thrust and lift, they were convinced belonged in the same family. "The Wrights," someone once remarked, "were certainly the world's first true aerodynamicists." Truer words were never spoken. The power flyer was a scientific experiment in the shape of wings and properly applied mechanical energy. The machine was not ready for shipment to Kitty Hawk until mid-September of 1903. The engine, propellers and the air frame and wings had been under construction since early spring. It was during this period, Orville admitted, that they changed their whole thinking about their work. By his own admission, he more or less verified the fact that they, themselves, believed they had indeed discovered a new science. They were both convinced that the power flyer, because of their accumulated know-how, could and would, achieve successful, sustained, controlled, mechanical flight with an operator aboard. "At this point," Orville said, "we began talking about a practical vehicle of the air, and we were beginning to think of flying as something much more than just the sport of gliding. We often talked of a flying machine that would become a new form of transportation, and every indication we got from our tests in the laboratory spurred us to drop everything else . . . We were almost certain success was within our grasp, and we wanted to complete that which we had started." This probably was the driving force that made them men of destiny. It was a characteristic both had from early childhood. Their word was honor. Their theories and claims disproved would have tarnished it. They had to fly. I remember one time I asked Orville - "Didn't you think that success would make you a millionaire?" It was a wrong question and brought displeasure in his expression. They were businessmen, he pointed out, successful in a small way with the bicycle business, and they would like to get back their investment - "about $2500 all told in the gliders and the power flyer including labor and materials." (Probably not counting their own time.) "At one time," he said, after their success, they "thought ten-thousand dollars would be a satisfactory figure for the invention." The fact is, they offered their invention to the U. S. for free. This, knowing that the government had given Langley $50,000 for his experiments! Strangely enough, when he died Orville Wright was not a millionaire. His estate was less than a million dollars. Yet they had given the world a priceless heritage - the wings of the eagle. The wings were assembled at Kitty Hawk during October and November of 1903. They were not ready to be tested until Monday, December 14, when they flipped a coin to see who would be the first man to fly. Wilbur won. He took his place, lying prone on the wing of the machine which rested on a monorail track, a launching method the Wrights had devised to help keep the machine straight into the wind. It consisted of about 60 feet of track, (two by fours) laid on their narrow edge with a thin metal strip on top, the machine resting on a dolly-like arrangement with ball-bearing rollers. The engine was started, the propellers given a twist, and the crucial test was underway. It took wing, and Wilbur was unquestionably the first to fly in a power-driven machine, but the result was far from satisfactory. Orville described it this way: ''The machine climbed a few feet into the air off the rail, then it stalled, and settled to earth about a hundred feet beyond. But it didn't really prove anything - it landed at a point lower in elevation than that from which it had started - proving little more than that we had glided down the hill with a heavier glider." Air time was a little more than three seconds. And the machine was damaged slightly in the landing. "We were satisfied with only one thing," Orville confessed. ''The launching method was safe and practical." It took three days to repair the machine and make ready for the next attempt. Day of de.s1iny: John T. Daniels, who ran the U. S. Coast Guard Kill Devil Life Saving Station, looked out the tower window on this particular morning, and little did he know that he was peeking over history's shoulder. What he saw was a stretch of desolate, isolated beach and the Wrights' camp. Then, his eyes spotted the signal- a piece of cloth streaming from atop the old shed where the "birdmen" were making their experiments. Daniels knew what it meant. Wilbur and Orville were about to try again their new-fangled flying contraption, which they had told him would fly through the air under its own power and carry a man aloft. Ridiculous? Daniels wasn't sure. He had seen some strange things happen during the past two years since the Wright Brothers had made camp on the lonely site a few hundred yards from the lifesaving station. At first, there had been those giant kites big enough to support a man. Then, it was the gliders. Now, it was this larger craft with its skeleton frame, the broadcloth-covered wings, and the maze of struts and wires. And it had a motor, the most polished powerplant he had ever seen, with a husky roar that silenced even the wind. The motor drove two huge fan-like propellers mounted on shafts between the upper and lower wings. Come to think of it, Daniels had to admit, the thing looked like a flying machine. When he saw the signal, Daniels decided to go down to the camp. As he walked, Daniels noted the wind velocity was about 27 mph! It was almost a gale blowing. He reasoned that no one would be crazy enough to brave such gusts in so frail a machine. But the Wrights were unpredictable. Arriving at the campsite, Daniels saw the craft was already in position on its launching rail. Orville was going to fly this time. His lithe frame (five feet, eight inches tall, 145 pounds) was stretched prone, head first, on the bottom wing to the left of the motor. He wore a strange, harness-like affair around his body at the chest and . shoulders. The harness was tied to the wing tips by long, flexible cables. By twisting his shoulders, the operator could warp the wings, changing the angle at which the wind would strike them. With his hands, the operator could control the throttle of the motor and, manipulating a stick-like control, he could change the angle of the forward elevator, up or down. His feet controlled the rudder, right or left. Daniels had seen them practicing and he had marveled at the coordination, the unnerved precision with which both the Wrights adapted to their unique control system. Then, Daniels noticed that the Wrights had changed the position of the launching rail. They had taken the track off the hillside and laid it on level ground. On this point, Orville years later recalled, "the track or launching rail faced into the wind on a slight incline. We wanted to make sure the craft's forward momentum and flight came from its own power and design, not taking advantage of a downhill run and gravity." It was 10:30 a.m. by Daniel's watch when the motor sparked to life. Wilbur gave the propellers a twist to start them and they began to revolve, slowly at first, then faster and faster. The machine shook and trembled. Then, Daniels saw Orville release the wire that held the dolly-cradle in restraint, and the machine started to move forward into the wind. Ten . . . 20 . . 40 feet it rolled over the monorail with Wilbur running along side, holding onto one wing tip to help balance it. Then he could hold on no longer. The craft was airborne. By the time it reached the end of the track it was in free flight, and still climbing. History was in the making. It rose to a height of about 10 feet above the observers' heads moving forward, but not at a very rapid pace in the strong wind. The left wing dipped slightly, but Orville righted it in time, leveled off. The nose pointed down, darting earthward at a rakish angle, but he made it rise again. Then, the plane dipped sharply, righted itself at the last instant, and hit the ground, landing on its skid runners and sliding to a stop- 120 feet from the spot where it had risen into the air. The flight had lasted 12 seconds. But in that fraction of a minute, the Wrights had turned man's century old dream of powered flight from fantasy into fact. The 12 seconds ticked off a miracle, and the short distance traveled was the start of a long journey into space. A man-made, heavier-than-air, power-driven machine had lifted itself under its own power, carrying a man into the air; had moved forward in full and controlled free flight at a sustained speed and, finally, had landed undamaged at a point of elevation as high as that from which it began its journey. Purposely, I have boldfaced the above, because it is the way Orville, himself, helped me to word a description of the impact of the event. Not until they had achieved all of these things did the Wrights feel they had conquered the air. They were very conscientious about making any claims of their progress after the Chicago speech of Wilbur's, Orville told me, and took every precaution to document and authenticate everything they did. 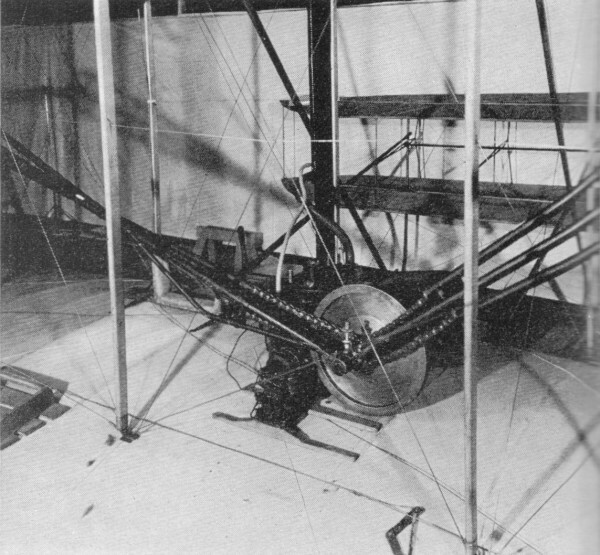 During the period at Kitty Hawk while they were assembling the power flyer, they devised a technique to measure its performance and built a device for this purpose using a stopwatch, anemometer and motor revolution counter. The watch timed the flight. The anemometer measured velocity of the air through which the machine traveled, and the counter told them the engine rpm. This improvised instrument started and stopped automatically. When used, it gave accurately the time, wind velocity and engine rpm. They measured the distance covered with a tape measure! Orville, one time, did some interesting doodling with figures about the first flight. The plane had traveled over the ground at a rate of 10 feet per second. Wind velocity at the time of flight was 35 feet per second. He estimated they were making about six mph ground speed, against a 25 mph wind. The first aeroplane had flown at the alarming speed of about 31 mph! There were other witnesses to the flight besides Wilbur and John T. Daniels. Other members of the Kill Devil Life-Saving Station, W. S. Dough and A. D. Etheridge, had also come down to witness the event. W. C. Brinkley, of Manteo, and Johnny Moore, a boy from Nag's Head, were also there. Strangely enough in 1938 (35 years later) Daniels and Etheridge visited Orville, and when asked about their reflections on the historic first flight, both answered - "It seems more of a miracle now than it did at the time. Perhaps, we were too close to what was happening." Indeed, they were very busy. The Wrights were not satisfied with making only the one flight that day. They made three more, and everybody present helped lay the track and get the machine in position each time. The proof positive: Orville, in recalling the day he became the first to fly successfully, said that he and Wilbur, long before their first success had decided that they would not announce it to the world unless they could make several flights. He reiterated that they wanted "positive proof we had solved the problems with the power flyer." In short, they were afraid that just one flight might be called a fluke which, sorrowfully, seemed to be the general attitude even after their great conquest. Public acceptance of the flying machine was hard to come by. But the Wrights and their five witnesses that day knew they had not seen an illusion. They and their visitors, after the first flight, carried the machine back to its starting point and prepared it for a second launch. This time Wilbur was at the controls. The wind had died down slightly when at 11:20 a.m. the machine started moving along the monorail. It lifted off at almost the same 40-foot mark, and behaved in its course much the same as before, although it moved through the air at a faster speed. The landing was smoother than Orville's and the machine had covered a distance of 195 feet, although it had remained in the air only a fraction of a second longer. About 20 minutes later (taking advantage of the wind conditions) Orville was again at the controls, and the machine started on its third flight. It lifted off the track gracefully but seconds later a gust of wind hiked its right wing up at a rakish angle and lifted the machine up a good 15 feet. To regain lateral balance Orville warped the left wing (aileron) and at the same time pointed the nose down. Control response was excellent, he reported like a test pilot. Perhaps, it was even too good, because the right wing dipped down - the first case of "wing-wagging" although certainly unintentional. Before he could level off completely the right wing tip struck the ground, and the machine slithered to a stop almost in a ground-loop, but undamaged. He was in the air 15 seconds, covering a little more than 200 feet, but setting a new altitude record! It was exactly noon when Wilbur began the fourth flight. In launch the machine behaved true to form as in the first three flights, but this time it obviously was "going places." Well beyond the 200-foot mark, it started to show decided control characteristics, much more so than the other flights. And it kept on going past the SOO-foot mark with little, if any undulation. The seconds ticked by. Then it began to pitch a little, wobbling, and finally darted to the ground, striking rather hard, and breaking the front elevator and supports, but no damage that couldn't be repaired. In its course the machine had covered 852 feet, and it had remained aloft 59 seconds! Then it happened. A freak accident. They were standing around the machine talking about Wilbur's flight when a strong gust of wind hit the machine and literally cart wheeled it. Wing ribs were broken, the engine damaged, and the guide chains twisted and bent. There was no possibility of any further flights without extensive repair work. That gust of wind may well have changed history. Because Orville said later that they had intended to make further flights that day, and even considered flying the machine over to Kitty Hawk several miles away. 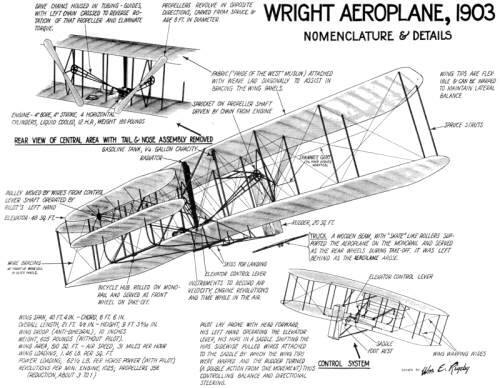 Had they made this flight certainly, there would have been fewer "doubting Thomases," and the Wrights would have been given their earned acclaim as the inventors of the airplane and the first to fly, at a much earlier date. As it was, however, December 17, 1903- in the two hours before noon, with a biting cold wind blowing across the windswept sands of Kitty Hawk - became a day for destiny. For that day the Wrights gave the world its wings. The machine they had devised and proved practicable, and its many descendants during the span of more than half a century has shrunk the earth, revolutionized transportation, opened new horizons for trade and commerce, created new battlefields high above the earth. And most important of all- introduced a whole new concept in man's thinking about time and space and the universe.